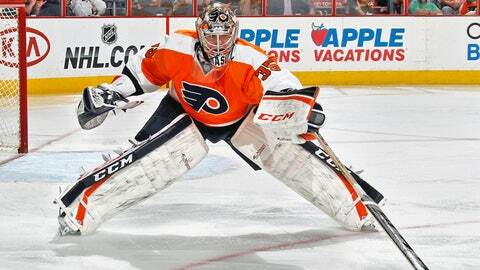 Philadelphia Flyers goaltender Steve Mason returned to practice on Friday. Philadelphia Flyers goaltender Steve Mason returned to practice Friday after missing the team's last two games due to a personal family issue. While Mason did not divulge the precise reason for his absence, he did note that he wasn't in the right frame of mind when he yielded four goals in under seven minutes in Saturday's 7-1 setback to the Florida Panthers. Michal Neuvirth stepped in on that night to finish the job before posting back-to-back shutouts in Mason's absence. Mason is expected to return to the crease either in Tuesday's game against the Dallas Stars or Wednesday's tilt versus the Boston Bruins. Coach Dave Hakstol told the team's website that he'd make that decision on Monday. Mason is 0-1-1 with a 6.12 goals-against average and .825 save percentage in two games this season after posting an 18-18-11 mark with three shutouts and a 2.25 GAA in 2014-15. Signed to a two-year, $3.25 million deal on July 1, Neuvirth turned aside all 31 shots he faced in a 1-0 victory over the Panthers on Monday before making 30 saves in a 3-0 triumph over the Chicago Blackhawks two nights later. Jeff Hackett (2003-04) is the only other Philadelphia goaltender to accomplish back-to-back blankings in his first two starts with the team.